CMFA friend Sarah Krueger is a rising star in the auction house world. We sat down with her to discuss how she got her start, camera-less photography and trends in the world of photography. We would love to know what made you decide to specialize in photography. How did you get your start and how did come to your current role? After moving to New York for my master’s degree at NYU, one of my first internships was with Phillips in the Photographs department. I was immediately fascinated by the fast-paced nature of working at auction, and really enjoyed working as a team to put a sale together. In 2007, I started full time with the Photographs department and have continued to grow in different roles since. In addition to being one of our auctioneers, I am currently a Specialist and the Head of Department for our Photographs auctions in New York. Christian Marclay, “Untitled (Luciano Pavarotti, Halo and Four Mix Tapes II)”, 2008, unique cyanotype on aquarelle Arches natural white hot press watercolor paper, 22 1/2 x 30 1/8 in. (57.2 x 76.5 cm). 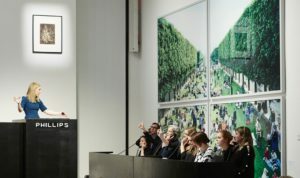 Are there any ways that the market for photography is different than the market for paintings and sculpture, such as what we might see in the contemporary art day and evening sales? The market for 20th century and contemporary works of art across all collecting categories is quite strong, making it is an exciting time for the market. At Phillips we’ve also seen a great deal of cross-category collecting. Collectors are no longer seeing the genres as separate and they are becoming much more receptive to the idea that works of photography, contemporary art, and design, are linked together through aesthetics and art historical importance. For example, this spring, a new world auction record was set for photographer Wolfgang Tillmans at our Evening Sale of 20th Century & Contemporary Art in London and in our upcoming October auction in New York, we are offering two unique works by Richard Pettibone, an artist whose works are typically offered in auctions of contemporary art. Specifically with photography, as it such an accessible medium there is also a wide base of collectors and enthusiasts. 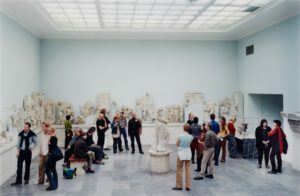 Thomas Struth, “Pergamon Museum IV, Berlin”, 2001, chromogenic print, face-mounted to Plexiglas. 56 3/4 x 89 3/4 in. (144.1 x 228 cm), overall 62 2/3 x 92 3/8 in. (159.2 x 234.6 cm), numbered 2/10. How do you decide which photographs make sense to include in your annual auction? Our photographs department holds four sales a year across London and New York. We also include works of photography in some of our traditional 20th Century & Contemporary Art auctions, as well as in our newly established auctions in Hong Kong. There are a few things we consider when accepting consignments for our sales. Quality, condition and authenticity are always the most important. We complete due diligence for every lot that passes through our hands to be sure that it is accurately represented. Rarity, historical significance, and provenance also come into play, as well as the market for comparable works. Our ultimate goal is to achieve a balance of classic and fresh-to-the-market contemporary material to keep our sales engaging for collectors of all interests. Do you have any advice for individuals who are interested in starting a photography collection? What role might an auction house play in building such a collection? My advice would be to educate yourself as best as possible, not only before you begin purchasing, but throughout your lifetime as a collector. You should always try to learn as much as you can about the works that interest you. Auction houses are a great resource for this, as all the specialists are delighted to help answer any questions or concerns you have, whether it’s related to a particular work coming up for auction or just a general inquiry. We are all passionate about the art that we’re privileged enough to work with every day and we’re eager to share our knowledge and experience. My other piece of advice would be to learn about your own personal tastes and, on occasion, think about branching outside your comfort zone. You might be surprised to find out what ends up piquing your interest. 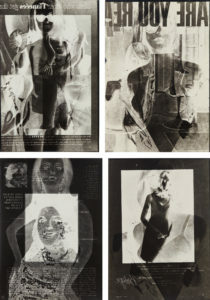 Robert Heinecken, selected images from “Are You Rea”, 1966-1968, seven gelatin silver prints, varying dimensions. What works from your upcoming October 3rd Photographs auction are you particularly excited about? Our Photographs auction brings together over 130 lots by 20th century and contemporary masters of the medium. We’ve selected a rare-to-the-market, unique cyanotype by Christian Marclay for the catalogue cover, Untitled (Luciano Pavarotti, Halo and Four Mix Tapes II), 2008 which is estimated for $40,000-60,000. 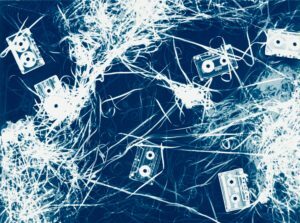 The subject of audio cassettes combined with the cyanotype – a camera-less process widely associated with the 19th century – forms an exciting pairing that mirrors Marclay’s talents as a visual artist and composer. Like Marclay’s work, Ray K. Metzker’s Blind Man’s Bluff, 1966, also shows an exceptional experimentation with the medium. Estimated at $20,000-30,000, this composite is one of only five examples in existence, as the intended edition of 10 was never fully realized. Additionally, Man Ray’s Rayograph, 1922, which leads the auction at an estimate of $250,000-350,000 showcases the artist’s then radical use of camera-less photography. His rayographs, such as the one in our auction, provided a foundation for contemporary experimentations with the medium that follow, such as Marclay’s and Metzker’s. This unique print is from Man Ray’s creatively active period in Paris, and reflects his early experimentations with the photogram technique, which stand at the forefront of Modernism. We invite your readers to stop by for our public viewing which runs from Monday, September 25 – Monday, October 2. 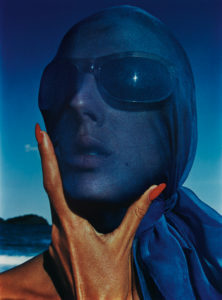 Hiro, “Tilly Tazzani with Blue Scarf”, 1963, dye transfer print, printed later, 18 1/4 x 13 5/8 in. (46.4 x 34.6 cm).